For the new police training centre at Hendon Fixmart supplied the main Ductwork Contractor with bespoke non-welded frames. Mace was awarded the £35m contract for the new police training centre in Colindale, Hendon which replaces the Peel Centre. This is part of a wider development by the Met to overhaul their land holdings. For this project Fixmart supplied the main Ductwork Contractor with 4 types of bespoke non-welded frames (1 for a kitchen extraction system and the other 3 for general roof extraction systems) as there was limited space available at the site. The frames were constructed from Framo 80, box section which has a high torsion resistance allowing for strong volumetric carcasses, whilst having a weight saving of up to 80% compared to traditional steel work profiles. 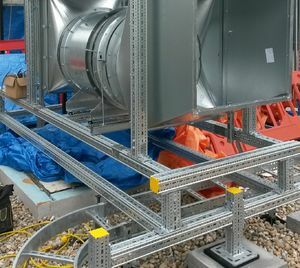 The frames were easily constructed off site at the contractor’s own premises and had the fans fitted to them. The fans complete with their frames were then delivered to site ready to be positioned. All connecting parts easily adjustable. All parts are re-useable so no wastage. "I am really happy with the frames and think they are an excellent way to install Fan assemblies especially in the orientation and location experienced at Hendon." As well as the bespoke frames we also supplied many of the fixings and fittings required such as Anti-vibration Feet, Slotted Channel, Square Plate, Multibands, Channel Nuts, Cut Studs, Wedge Nuts, Rubber Washers, Brackets, Rubber Feet with Strut and other general materials for their stores. The new training centre complex was designed by Bennetts Associates and involved demolishing existing buildings and constructing two new buildings (up to four storeys high). The project also includes the relocation of the Grade II Listed Sir Robert Peel Statue and Police Call Boxes as well as creating a new memorial garden. Land on the 73 acre site not needed for police training will be put aside for building 1,650 new homes along with retail units, a primary school and nursery. The first College on the site was opened in 1934 by the Prince of Wales. The Sir Robert Peel Centre was opened by Queen Elizabeth II in 1974. Between 2,000 and 2,500 recruits passed through the Peel Centre each year for basic training. The centre ran courses on many aspects of police work, from forensic and crime scene analysis, to radio operations and driving skills. The centre had extensive sports facilities, mock court room, road system and police station for training. The centre at Hendon has a reputation as one of the world’s leading police training facilities, and the Met's aim with the new development is to provide improved training facilities suitable for serving future generations of police officers.